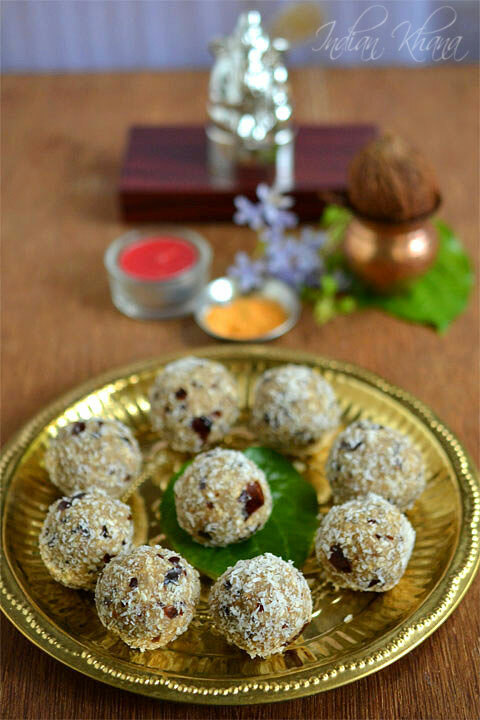 Dates and sesame seeds laddu is made only with 3 ingredients and it's sugar-free, ghee-butter-free, fat-free and guilt-free sweet. 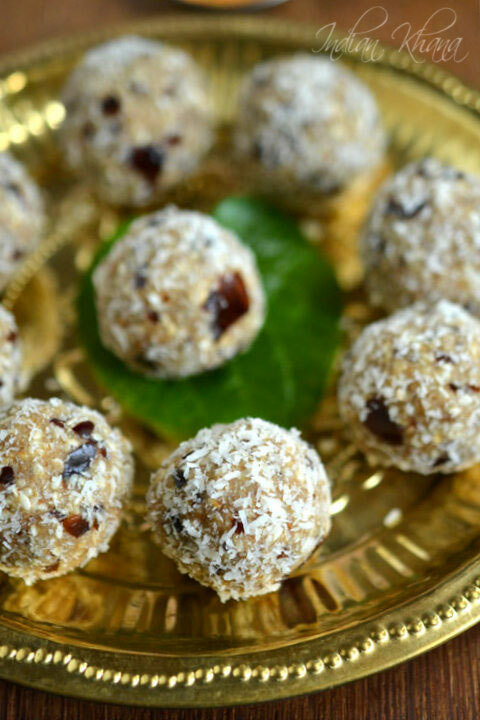 Perfect for any time whether you are having sweet craving or as a dessert, snack, Naivedyam and for all festivals as Ganesh Chaturthi is approaching and Ganeshji likes laddu very much I thought of sharing this recipe with you all as it's easy, quick and good to have healthy sweet among all the various goodies made during festive. 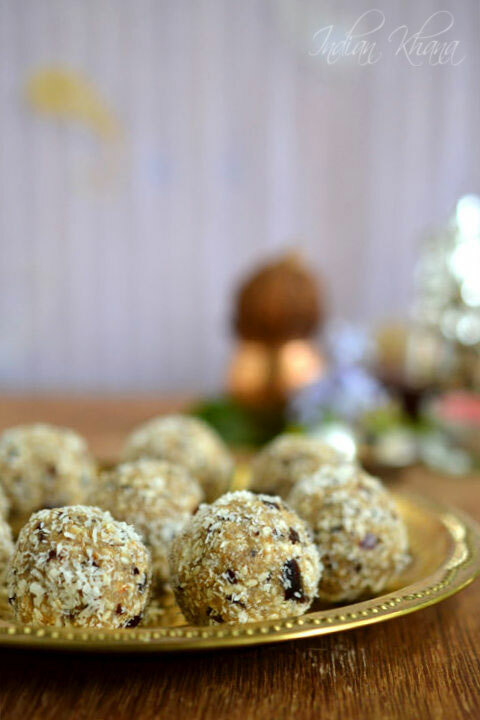 This is good recipe for all the calorie watcher as this laddu is full of goodness and can celebrate Ganesha Chaturthi or other festivals without much worry. We can also make this in advance and keep so the D day can be less stressful, you can also make this in modak shape instead of regular laddu for Ganesh Chaturthi and in normal days make it as laddu or even peda. 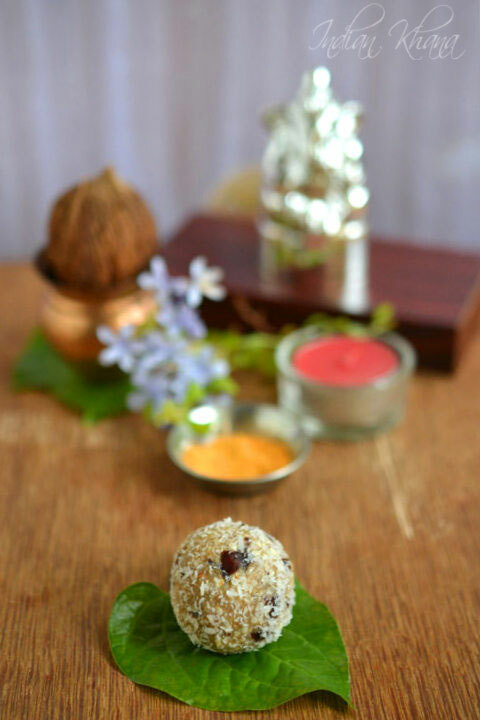 Use good quality dates to make this laddu, try to use fresh ones as those as moist and helps to bind laddu well. I used here Organic Iranian dates here (in case you want to ask it's available in Fair price at Singapore). Dates or Khajoor nutritional value is very high it's very good source of dietary Potassium, consists protein, fiber, zinc and many other. In nutshell dates/khajur is full of goodness we can also eat 1-2 dates every day for health benefits. I never buy seedless dates also go for dates with seeds and pit it myself, it's up to you what choose but check the manufacturing or packing date before buying. You can also check Dates, Figs and Dry Fruit Roll which is again sugar-free, fat-free and vegan. From dates let's learn something about the important ingredient in this laddu - Sesame Seeds/Til/Ellu. Sesame seeds has one of the highest oil content of any seed, sesame seeds are rich in nutty flavor, Omega 6 and it has natural antioxidants, also rich in protein. Do you know Sesame Seeds has 50% oil content compare to Soyabean's 20% and important point 100gms of sesame seeds contains 975mg of Calcium way too ahead of flax seeds which has 225mg of calcium per 100gms and much more from milk which has 113mg of calcium per 100gms serving, amazing right? Sesame seeds also comes on #3 in top 10 food in calcium. So if you think milk is high source of calcium then try sesame seeds, hope you understood how important is sesame seeds in our diet and this laddu is wonderful way of consuming it. This is just not laddu but full of calcium, fiber, protein, potassium and what's more no added sugar, ghee or butter and it's vegan. Check the step wise picture you can see once I mixed all the ingredients and start making laddu my hand looks so oily, that's from sesame seeds natural oil making the laddu moist. This recipe I wanted to share with you all for long time but it was not happening but then what better than share this goodness during festive season where we can still eat healthy and tasty food and this is also my 500th post so perfect time to share some sweet. 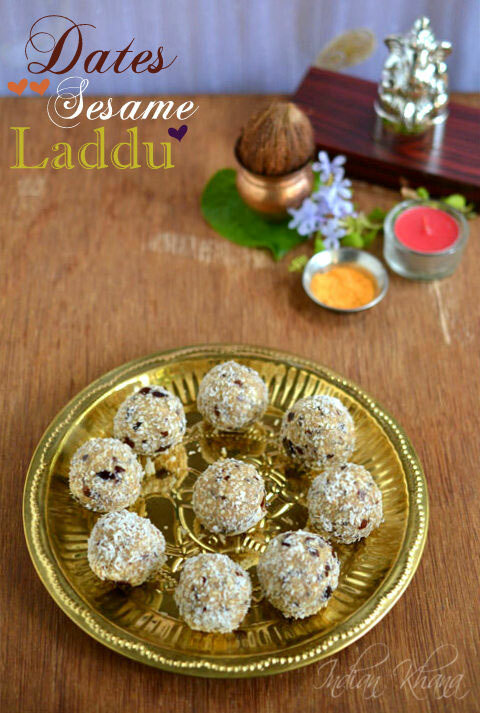 This laddu taste really good, dates gives sweetness, sesame seeds gives nutty flavor, crunch and moisture from sesame and coconut. Or you can make this during Navratri again as Naivedyam this also works as Vrat/fasting food, or just make this for dessert and make your lunch/dinner a grant affair. Other traditional Ganesha Chaturthi recipes you can check Ragi Inippu Pidi Kozhukattai, Rajma Modak, Ukdiche Modak, for full list of recipes collection click here. 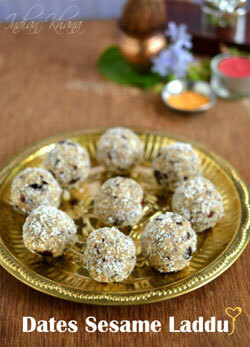 Dates, sesame and coconut laddu is vegan, sugar-free, quick and easy. Remove seeds from dates if not suing pitted dates and finely chop it. If you keep dates in fridge then take it outside a night or day before, this will make dates soft, easy to chop and make laddus. Dates has to soft so it can bind well. Grind sesame in a mixer or coffee grinder only for 3-4 seconds, don't not grind more than that, we want to light crush the sesame seeds and not powder it. While you grinding count to 3 so you don't over do it :) OR you can also pound sesame seeds in mortar and pestle. Take sesame seeds in a large bowl, add chopped dates, coconut (keep 1 tbsp of coconut aside) and mix well to combine everything together well and to bind it, using hand is best option. 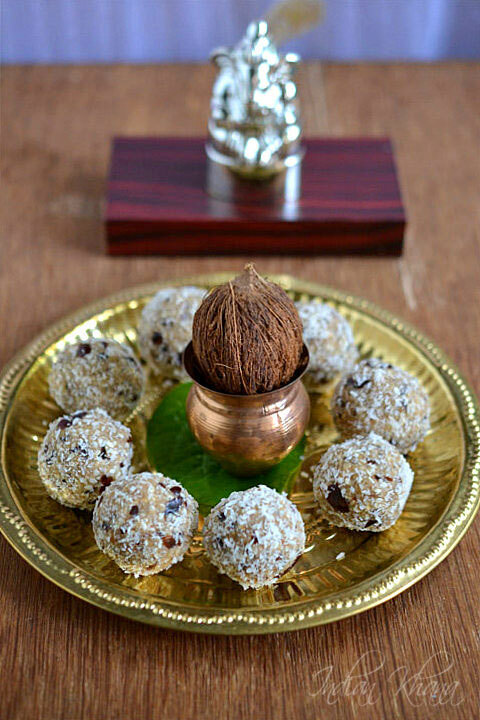 Take small amount of mixture and roll it in hand to form a ball or laddu shape, roll prepared laddu in coconut we save and repeat same for rest. Our laddu is ready, store in air tight container. If you dates are not sweet enough then add more dates. If mixture is not binding well then add 2-3 tbsp of honey to help it bind well. For Vegan version use oil. You can use brown or black sesame seeds or a mix or white, brown/black sesame seeds too. Use fresh good quality of dates. 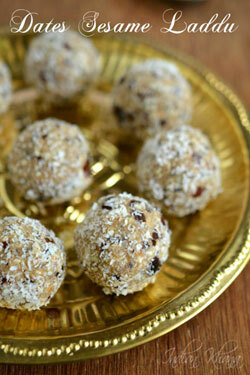 Relish healthy laddu on Ganesha Chaturthi or every day.